Teresa Just Wants To Have Fun — Outside of a Nursing Home! My sister, Teresa, sang and danced on-stage at the Best Buddies Karaoke event at the University of Victoria on March 13, 2015. It’s just one of many wonderful and amazing experiences she has had in the past 15 months that she would NEVER have had if she had stayed in the long-term care home where was forcefully placed in 2013. Her case is a shocking abuse of a vulnerable adult. She tried to defend herself but could not. It is up to us to stand with her and demand an apology and accountability for the wrongs that were done to her. Please watch the video below and then SIGN her petition demanding an apology from the CCAC and the Rekai Centre. Please sign Teresa’s petition: Tell the Ontario Government, Human Rights Should Never Be Disabled. at Change.org. It has been one full year since Teresa’s petition “Human Rights Should Never Be Disabled” launched on World Down Syndrome Day, 2014. We would love to able to declare “Victory”, but we can’t. Not yet. Teresa was, and is, demanding an apology from you for the harm your organizations have caused her. 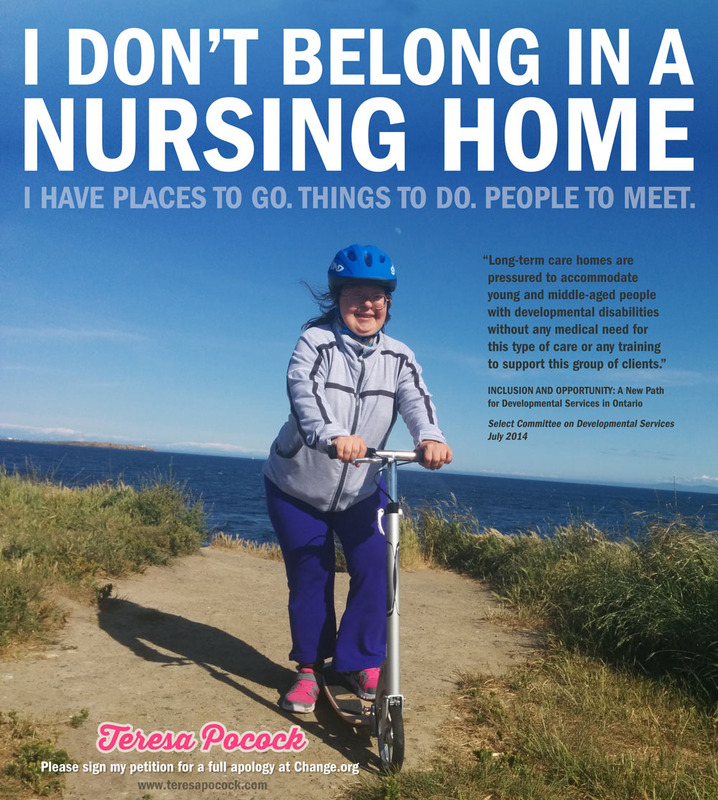 The fact that Teresa has been thriving for the past 15 months, living outside of an institution with me, her sister, is proof that she should NEVER have been placed in long-term care. Over 25,000 people, 9 MPPs, and countless Toronto Star readers, are now watching how you handle this crisis — and the numbers demanding an apology are growing everyday. We are not giving up. Her case is a shocking abuse of a vulnerable adult. She tried to defend herself but could not. It is up to us, 25,000 strong, to stand with her and demand an apology and accountability for the wrongs that were done to her. Teresa was hopeful the CCAC and the Rekai Centre would do the right thing. We were encouraged by the fact that Ms. Daub, CEO of the Toronto Central CCAC, apologized to Teresa within 48 hours of the petition’s launch. Ms. Daub wrote, “I apologize for any part the Toronto Central CCAC contributed to this.” That was quickly followed with a promise that the CCAC would conduct a “comprehensive review”. But whatever was learned in that review has been kept secret from us. The CCAC has failed to admit the errors that led to Teresa having her rights taken away. This adds further injury to Teresa and means that other vulnerable adults may face the same problems as Teresa. 1. Why did the Rekai Centre call the police reporting Teresa as a ‘missing person’ four days after she was legally discharged? 2. Why have the Rekai Centre emails and records concerning the police call not been released? Why are they being kept secret? 3. Conflict of interest: Did the fact that Teresa has a relative on the Rekai Centre Board of Directors influence her placement? Did this conflict of interest influence your decision to call the police to force Teresa back into your nursing home? 4. The CCAC records show that Teresa’s siblings called you directly on several occasions. This was considered “unorthodox” by the CCAC and raised alarm bells which took the matter further up their chain for review. Did the CCAC know about the conflict of interest? These are just four of the disturbing questions we need answered. It’s time for the Rekai Centre to explain its actions in full and publicly apologize to Teresa. It’s time for the CCAC to deliver on their promise to investigate and own up to the mistakes that wrongly forced Teresa into long-term care — and explain why they looked the other way when they learned that I had offered to have Teresa live with me. The failure of both organizations to respond is creating even more turmoil in Teresa’s life and making the situation even worse. Teresa is right. She should never have been forced to live where she didn’t want to go. She is capable of making her own decision on where to live. Teresa needs to be heard! She knows what she wants and needs. Please pay attention to her and her family. suggest you look at german method for integrating downs people – they are very mainstream in life / activities. i used to see the same 2 ds adults every day as they went about getting themselves to school using transit ALONE. they were always smiling – even when tearing along as if late for their bus. it was a nice thing to see somehow. very good idea. you have my support. my aunt had downs. One set of parents was advised NOT to even see what their infant looked like. I would hope that like in the real world, people are fired in disgrace for unacceptable behaviour but alas, government is very corrupt in this country. The truest measure of a society is how it treats it people – especially the most vulnerable. Rekai Centre: Please apologize to Teresa Pocock. Please reopen it and we will fight this injustice together! Thanks to Isabelle: The petition is RE-OPENED! Way to go Teresa. Thank god your sister was able to rescue you. We had the same type of thing happen to my mother-in-law but unfortunately she passed away before we could bring her home. (this was due in part to poor care). Again it was CCAC who made the decision and threatened us with police action. I am so glad you are living your life to the max. I have witnessed two deaths directly resulting from involuntary and unnecessary confinement to long term care facilities..
Stay the course, don’t let the institutions run your family. It is clear that Teresa is loved and cared for. I am touched by your amazing devotion and commitment to your sister. I am also not surprised by your experience. This type of heavy handed approach to many social issues is a daily experience for me. Often those in place, as professionals, shouldn’t be. I was told once they typically attempt to conduct brain surgery with meat cleavers. Your petition is closed, I couldn’t sign, but would gladly. Your smile is like the sunshine ! You deserve the best, Girl!!! A great injustice has been done by people in authority. Instead of using that power for good, it is blatantly obvious that incompetence and possibly underhandedness prevailed. Disgusting that something that is to help others, did quite the opposite and had made them suffer. I am grateful that Teresa’s sister advocated and that now Teresa is in no danger of being abducted and put in a nursing home. My outrage is that not everyone with DS or other developmental disability has someone like Franke – or anyone for that matter – in their corner. Until a publicly revealed report on all that led up to and obstructed Teresa’s attempts to escape the nursing home ‘abduction’ – and a full apology that promises to never allow that to happen again for anyone with a developmental disability – then it can only be concluded that this practice continues to this day and Teresa only escaped because of the intense exposure in the media (thanks to her wonderful and talented sister Franke). 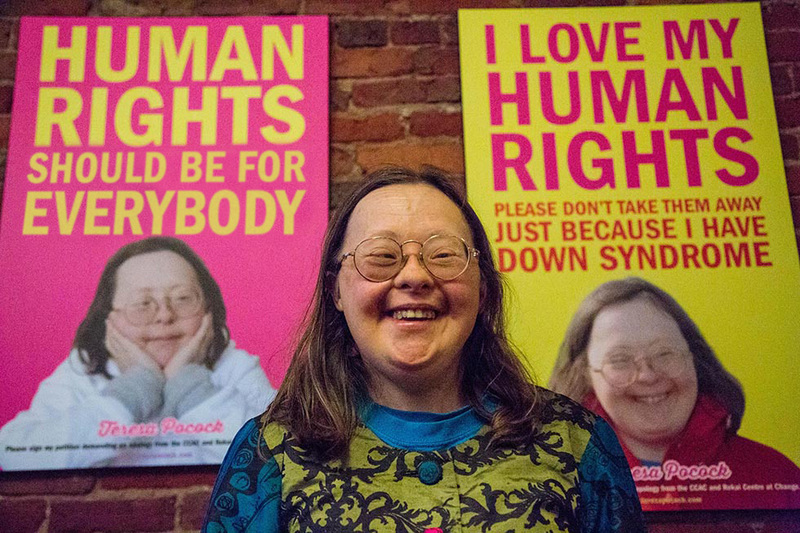 HUMAN RIGHTS SHOULD NEVER BE DISABLED!! Thank you for your comment. Change.org re-opened it thankfully! I really appreciate everyone’s comments here — there are tears rolling down my face. Your support gives me strength to continue. The petition is OPEN again! Thank you so much for your support — I am thrilled to see the many, many heartwarming comments. Please share the petition with your friends so we can, as you say ‘fight this injustice together’. I think it’s wonderful to know that Teresa is finally having a life on our west coast; she didn’t deserve to be institutionalized! If a person is capable of making a decision about where and how they want to live, or a responsible member of their family is willing to step up, then the government/law should have absolutely 0 say in the outcome. I truly hope you both have long and happy lives. It looks like ego’s and authority were challenged and that created fear and resentment. Keep to your path and never give up. We are listening and here to support you. How are you? I live in Ottawa with my mom, dad and brother Mike. We like to go skiing, skating, swimming and taking pictures with camera. We hope you are happy and healthy! Thank you. Good Bye. My 8 years old has DS and I was shocked by what happened to Teresa. It could happen to so many people. The whole system should change. Families should be able to make their own decisions, they know what’s best for them. I will never forget when the hospital doctor asked us if we want to keep our son when he was diagnosed with DS. I couldn’t find a single word to show him my disgust. He is the sunshine my whole family. Keep up what you started. I have signed your petition and shared it on facebook. I think it’s horrible that you were forced to live where you clearly did not want to!! And then you were legally discharged only to have the police pay a visit?? The people responsible for this should be disciplined and you definitely deserve an apology along with some answers!! Keep on keeping on! You deserve to be happy and thankfully, you have family who love and support you!! Your smile is love at its finest!! Blessings to you and yours!